There is no mention of children in these verses. To the contrary, in order to reach marriageable age, it is clear that one must be of sound judgment, maturity and certainly old enough that their wealth and property can be fully entrusted to them. Furthermore, the mention of witnesses in their presence clearly implies a discharge of responsibility and contractual in nature. There is no indication that any of these can be accomplished with a child. Relevant verses should be understood in this light. Whilst verse 4:6 clearly twins 'marriageable age' with the ability to entrust orphans with their wealth and property, another verse 6:152, clearly instructs believers not to come close to the orphan's wealth until they are 'ashudd', implying physical maturity, full strength or to be in a state where one is fully grown. Thus keeping both verses 4:6 and 6:152 in view, attaining maturity also becomes a precursor to discerning marriageable age. "And do not go near to the wealth or property of the orphans except with that which is best until he reaches his maturity (Ashuddahu)..." (Part of Quran 6:152). The Arabic term 'Ashudd' indicates mainstream physical maturity or full strength. For example, in verse 12:19 one notes that Prophet Joseph (peace be upon him) was taken as a mere boy (ghulamun) and later in verses 12:22-23 we are informed he was old enough to be seduced after reaching 'ashudd' (physical maturity & full strength). Thus, “ashudd” implies that both physical and mental maturity are imperative in discerning marriageable age. (This meaning is further confirmed by LANE. E.W, Edward (Lanes Lexicon, Williams and Norgate 1863; Librairie du Liban Beirut-Lebanon 1968, Volume 4, Page 1519)). Furthermore, the matrimony, 'Nikaah' has been described in very specific Arabic terms by the Quran as a “Meethaqan Galezaan”. The importance and gravity of such a covenant can be well attested by the two examples above. The only other time such a description has been used in the Quran is when the marriage bond has been described in 4:21 of the Quran, a betoken of its seriousness. Thus, both parties entering the contract should be of sound mind and maturity, assessed for marriage suitability and can fulfil the obligations being agreed to within the contract. Despite of what has preceded some perversely assert that God in the Quran allows such a marriage since 33:49 of the Quran, instructs believers that there is no 'waiting period' (iddat) for women who have not had their marriages consummated. Therefore, the verse 65:4 of the Quran [below], by virtue of a 'waiting period' (iddat) being present, is only dealing with 'consummated marriages'. Up and until this point, the assertion is sound and correct. However, it is then further asserted [by some] that the phrase 'lam yahidna' (no courses) implies young girls that are not yet menstruating. Therefore, as this phrase is present in the verse dealing with consummated marriages, it is then asserted that consummation of marriage is allowed with prepubescent young girls, regardless of what age the child may be (minors). Howbeit, the verse of the Quran 65:4 Such of your women as despair of menstruation (ya'isna mina-l-mahidi), for them the prescribed period if you have any doubts (ini ir'tabtum) is three months and for those who have no courses (lam yahidna)(it is the same): for those who are pregnant (wa-ulatul-ahmali) their period is until they deliver their burdens and for those who fear God, He will make their path easy. Refers to all those women that for one reason or another have never had courses, or, though they expect to menstruate, have not done so, for whatever physiological reasons. Therefore, to even consider those who have no courses ‘lam yahidna' as prepubescent female minors is absolutely not warranted by the Quran. 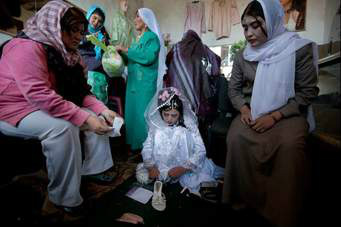 Furthermore, it is inconceivable that an exemplary Prophet of God (such as Muhammad peace be upon him) would endorse [let alone practice] child marriages – therefore any indication in ‘secondary sources’ must be judged in the light of the Quran. Unfortunately, many Muslims disregard the teachings of the Quran and adopt doctrines and concepts from fallible ‘secondary sources’ instead. In contrast to the arbitrary age of consent laws used in the world today, God in the Quran holds the only objective standard of measure with which to prevent child abuse from occurring, since the differing maturity levels (in physical, mental, and emotional terms) are accounted for. It is a standard which may be used in various societies and time, as it measures more than mere age.